I can't believe the devs are pushing Restoration Druid. I don't know what to expect from this. 5 mana, summon 2 4/4s sounds good, but the revealed spell is really weird/weak (the spell is good with the auctioneer). As I said - I don't know what to expect from this. When I saw Stalladris, my first thought was how he could be good in a control deck. I mean, he can grant you amazing value the more Choose One spells you cast. Now druid gets something, I never thought it would happen - support for Resto Dudu. In the past the only healing cards druid ever had were Tree of Life, Moonglade Portal, Healing Touch and Ancient of Lore and those were used before druid got powerful armour generating tools. To me a healing archtype just screams for control druid, but the problem is that the class lacks good AoEs and hard removals (they are about to lose Naturalize). Not to mention - what's the win-condition of this deck? 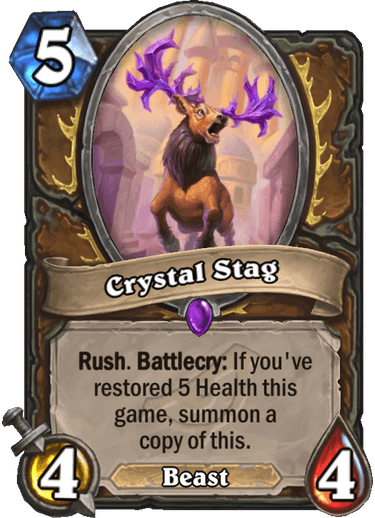 Can the druid buff the stag (with the exception of that Untamed Beastmaster? No treants no Hand no Attackpower....now its healing apperently cant they just finish with 1 random theme for Druid?! It's better than armor druid, in the sense that it feels less opressive, not better as in better mechanic, I like this payoff,also there's a 1 mana spell that synergies with this. Well, 2 4/4's with rush for 5 mana is crazy. Restoring 5 health isn't too hard in most classes, but druid might have some trouble even with the new companion card. I'm just glad they are moving away from giving druids armor. I need to see more cards if i have to say playable or not , but looks promising. Work like Saronite Chain Gang, so u can buff this minions in your hands and summon 2x 6/6 7/7 or 8/8 rush for 5 Mana. Hopefully, this implies they are introducing some new efficient Healing for Druid. "The quickest way to 'think outside the box' is to realize the truth: the only real box is the one you create by limiting your thoughts." How is druid healing before turn 5? We are going to need to see a great lifesteal minion for Druid in this expansion or this card is just 100 dust waiting to be disenchanted. Here's hoping that it actually works. Also, I really hope they clean up the art for it in game. The picture looks really blurry.